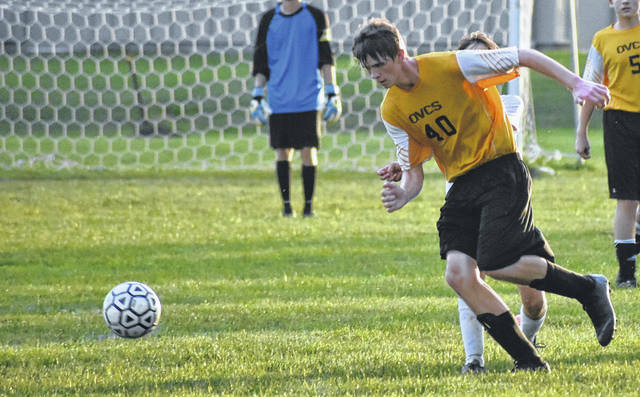 Ohio Valley Christian’s Andrew Dubbs (40) pursues the ball during the Defenders 7-2 victory over Calvary Christian on Tuesday night in Gallia County. GALLIPOLIS, Ohio — The first half told the story. 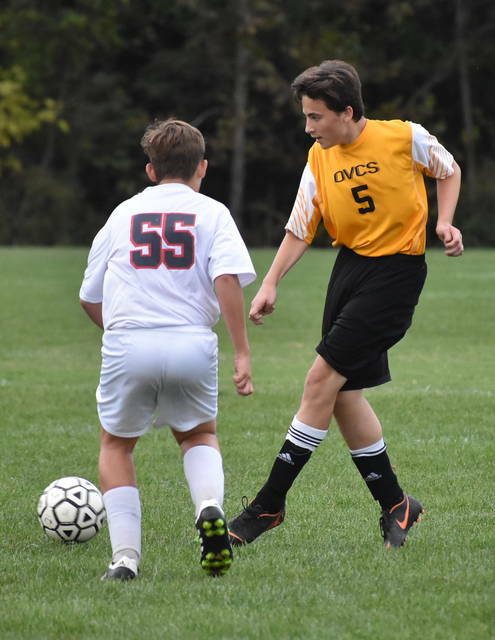 The Ohio Valley Christian School varsity soccer team earned its first victory of the season, as the Defenders scored seven goals in the first half en route to a 7-2 victory over visiting Calvary Christian on Tuesday night in Gallia County. OVCS (1-14-0) jumped to a 1-0 advantage when Andrew Dubbs scored at the 35:35 mark of the opening half. Justin Beaver added a second goal 1:29 later to extend the host’s advantage to 2-0. The Defenders widen the margin to 3-0 on a goal by Brayden Burris off an assist in the 7th minute. OVCS furthered its lead to 4-0, 9:14 into the contest, as Trevor Blank scored his first of two goals in the match. Burris, however, tallied his second goal of the match at the 23:39 mark, to push OVCS ahead 5-1. The Defenders widen the margin to 6-1, in the 24th minute when Blank tallied his second goal of the match. Camryn Tyree propelled the hosts to a 7-1 lead in the 43rdminute when her shot from inside the box found the back of the net. Calavary Christian scored the final goal of the match, with 39:15 remaining in the second half, when Caleb Parra closed the margin to 7-2. The Defenders outshot the Patriots by a sizable 35-15 overall margin, as both teams finished corner kicks apiece, respectively. Calvary Christian senior goalkeeper Bryce Sexton finished with 22 saves. In contrast, OVCS freshman Conner Walter finished with seven saves, while senior Justin Beaver had one save. For OVCS head coach Jason Beaver, the victory was a fitting way to celebrate the team’s senior night for squads five senior members in Dubbs, Beaver, Blank, Tyree and Michiah Swab. Up next for the Defenders, a road date with Parkersburg Catholic.